Are Your Aging Parents Driving You Crazy? 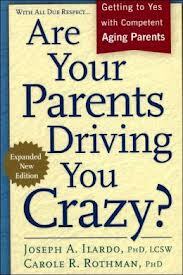 In the introduction to their second edition, Joseph A. Ilardo and Carole R. Rothman, the authors of "Are Your Parents Driving You Crazy" state that "the title of this book appeals to adult children who don't know how to be helpful to their parents and are frustrated by their confusion." In particular, the authors say that "this book is targeted to adult children who are working with parents who are rational and completent but who are not being reasonable about some problem that should be easily resolved." The book is structured in four sections. In the first section, The Context, the authors lay out their basic assumptions: your parents are capable of thinking clearly and making rational decisions, you and your parents are communicating, and your parents have been managing their lives successfully up until now. They present many useful guidelines for "talking so your parents will listen, and listening so your parents will talk." They also provide some strategies for breaking an impasse if you arrive at one. Finally, the method to S.U.R.V.I.V.E. is presented. This is an approach to helping the adult child keep his or her cool while trying to resolve dilemmas with aging parents. The second section is labeled The Model. This section details a problem-solving method the authors say will help you resolve any dilemma you are likely to encounter. The rather simplistic model focuses on first clarifying the problem faced and then provides steps for solving the problem. Each of these two steps consists of six questions for you to address to do so. While the questions might be thought provoking in some instances, they do appear somewhat basic and intuitive. That said, sometimes it can be helpful to have a rubric to apply and if that is your situation, then this approach may well prove to be of assistance. The third section, The Dilemmas, selects twenty five of the most common dilemmas adult children struggle with and shows how to apply the model to dealing with them. This is where the rubber meets the road. Each of the twenty five discussions is structured the same: description of the situation, use of the model to clarify the problem by addressing the six questions, and then an offer of solutions based on the six steps presented by the model. The authors provide a grid for each dilemma with needs on the vertical axis and possible solutions on the horizontal axis, and they fill in the grid. The idea is that you can match up your particular situation and discover the range of options and then select the one that is best for you. To evaluate the effectiveness of this model, I recently used it with a client family since the dilemma they faced was exactly that presented: My mother clearly needs to see a doctor, but she refuses to do so. The "preferred solution" the authors propose is to suggest some alternatives to your mother that she might find acceptable, and if that fails, to ask people your mother respects to intervene. If that is not successful, the authors suggest that the adult child takes over, even calling in Adult Protective Services if necessary. The authors are careful to make the distinction between taking charge and taking over, and do acknowledge that taking over is a last resort. My client, the adult child, and I walked through the model. While the discussion was useful, we actually came up with an approach that was not suggested by the model at all. Namely, I, as the objective third party, met with the mother and talked with her about how she was feeling both physically and emotionally. I discovered that she was afraid that she would be "put in a home" if she went to the doctor because she realized that she had become incontinent. Her reluctance to see the doctor was driven entirely by this fear. Once I was able to help her understand that this was not the only possible outcome of a visit to the doctor, she agreed to go. So, at least in this case, the solution was to uncover what was going on with the aging parent by the use of an outside resource and this was not suggested by the author's model. The final section of the book is entitled The Caring Partnership. The focus of this is to avoid the problems and dilemmas by planning ahead. Those who are frequent followers of this blog know that planning is my passion! Further, the authors make the case that a cooperative relationship (or partnership) between parent and child is the ideal but that reality often falls short. In summary, there are some useful tidbits in this book, and the model presented may be helpful, especially for families beginning on their caregiving journey. I do believe, however, that it may be overly simplistic and formulaic and encourage you to think creatively and outside the box when engaging with caregiving challenges.